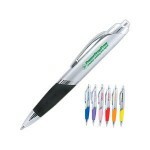 Celebrate Mardi Gras with our rainbow themed ballpoint pen with frosted grip and chrome accents. Use it for a Mardi Gras theme marketing campaign or promotion. Available in black, blue, orange, pink, purple, red and yellow.